I'm going to take a few moments to gush about a new kitchen fixture I splurged on. You see, I'm a tea drinker, and something I've always wanted is one of those instant hot water spigots you can add to your kitchen sink. Not a pot filler...this is designed to pour near-boiling water from a spout as you open the tap. Recently, my regular kitchen faucet (which was a temporary hand-me-down 9 years ago anyway) kicked the bucket. 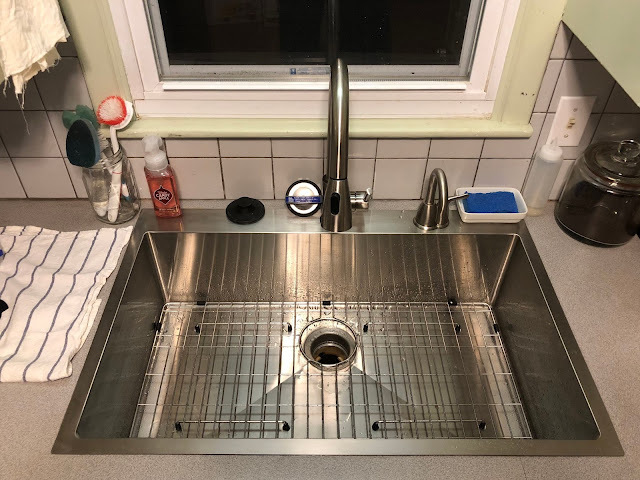 I've never much liked the old scratched, rusting, gray-enambled cast iron kitchen sink and the way it was installed, it's nearly impossible to reach to install a new faucet anyway. So I decided it was time to just spend the money and put in a new sink. And since I couldn't have my dream sink (an apron/farmer's sink) without renovating the entire kitchen, I was at least going to put in my hot water spigot. Isn't it great? It's HUGE...like my 6 year old daughter could take a bath in it, huge. We prefer a single-bowl sink over a dual-bowl. I simply put a small dish pan on one side so that anything collecting in the sink is out of the way and I can still use the disposal. Off to the right, there, you can see my new fancypants hot water spigot. Just turn that handle and I have an instant cup of hot tea. Not shown, I also purchased this dish pan. Let's talk about my thoughts on each of the products, shall we? I chose this sink because I wanted a single-bowl sink and the description included dimensions that assured me it would fit in my existing hole (I wasn't replacing countertop in this project). Also, I liked the squareness of it. While it does look a little industrial, I just felt it looked better and sturdier than a "contractor-grade" sink you might find at the home center. It will scratch if you use a green scrubby pad on it (ask me how I know). So only blue ones from now on (blue are made for Teflon pans). The grate is nice for keeping things up off the bottom of the sink, but it doesn't work so well with the garbage disposal. Food just gets stuck under it (or in it) and if you don't have great water pressure, coaxing it into the hole is a bit of a chore. I may try a rubber or silicone mat instead--probably a cut-down bath mat with suction cups on the bottom. It's squared-off and the old hole was rounded. This ordinarily wouldn't have been a big deal except the previous owners oversized the original sink for the cabinet and had already cut away bits of the cabinet supports, so I had to do a lot of work cutting away even more--and we didn't really have the right tools on-hand. This sink doesn't come in more than a two-hole design. This means if you want a built-in soap dispenser on top of the hot water faucet, you'd have to find the right tools to drill a hole in stainless steel. I decided this wasn't a deal-breaker and just put the soap on top. I was a little skeptical purchasing a no-name faucet, but the high star rating for this one was well-deserved. There are no plastic "brushed nickel" pieces. They're all actual metal. It assembles easily and feels sturdy. There was one small downside. In the photos shown on Amazon, it shows the handle on both the left and the right, indicating it can be placed where you want it. Turns out, it's actually a left-sided handle. If you place it on the right (which is where my old one was), it reverses the water so that hot is down and cold is up. I didn't want anyone burning themselves, so we just reversed the hoses under the sink. Because the blue/red color indicator is also facing the wall, nobody will read it and choose the wrong one. However, the lever does hit the wall since the "down" (which is now up) goes down further than the other direction. Again, not a huge deal breaker. Overall, I love this thing. Seriously. I use it to make tea. I use it to fill small pans of water to give them a kick-start heating (the tank only holds 3/4 of a gallon, so you're not going to use it to fill a stock pot). I've used it to get stuck-on bits off of plates quickly (like the cat's bowls). And I frequently use it for other cooking tasks like pouring water to soften the sealing compound on canning lids or adding water to soups or to the Instant Pot. The instructions say it will reach temperatures up to 200 degrees, but I've rarely been able to get the thing over 190 and I have it turned up to the highest setting. This was a common complaint in the reviews on Amazon I'm okay with it, as I don't like particularly dark tea, but if you're a tea snob (brewing black at 212 and green at "just off the boil"), it won't work for you. Stick with an electric kettle. The heating tank is essentially the same from model-to-model but the price skyrockets quickly the nicer you want the visible handle to be. ISE could seriously make their price jumps between handles a little less drastic. Also, there were complaints in the Amazon comments from long-time users that when the tank rusts-out, you can't replace just the tank. You have to buy a whole new kit. Average lifespan seems to be 7 to 10 years. The handle I bought is a right-hand only handle, which people complained about in the reviews. It works great if you're a righty and you place something in the sink and pour water into it (your right-hand goes for the handle). But if you have a tea cup in your right hand (the natural pose for drinking from it), you have to reach over/behind the faucet to turn it on with your left hand and you do risk burning yourself if you accidentally reach UNDER it instead of behind. Installation is generally easy, but for some silly reason, it comes with everything you need EXCEPT the shutoff tee you need to adapt it onto your existing cold water pipe. Ordinarily I'd say plumbing parts shouldn't be included, but this is a pretty standard connection that should work with anyone's plumbing. It also comes with all the other connections and hoses--so why make customers run to the plumbing supply store for one piece? The fitting is less than $5 retail. They could have included one. Let's be honest. This is expensive for a dish pan. However, I've had other dish pans and I don't love the way they hold-up over time. This one looked sturdier and I liked the square, tall shape, as it'd take-up less space in the sink (I leave it there to collect dirty dishes when the dishwasher is otherwise occupied). It also had the drain feature, which was intriguing and might prevent stagnant water from getting trapped. Overall, I'll say it's worth the money. The only part that could use some improvement is the drain. It has a tendency to close itself somehow. I wish they'd add a little friction to it to keep it where you put it.